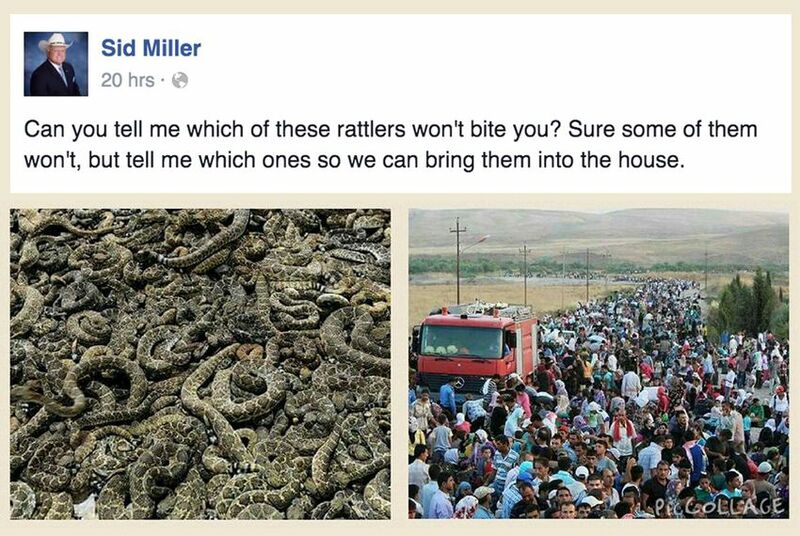 Texas Agriculture Commissioner Sid Miller — no stranger to social media fireworks — appears to be comparing Syrian refugees to venomous rattlesnakes. Sid Miller Facebook page. Image re-formatted for space. *Editor's note: This story has been updated to include comment from Miller campaign spokesman Todd Smith. Texas Agriculture Commissioner Sid Miller — no stranger to social media fireworks — is now comparing Syrian refugees to venomous rattlesnakes. In a post on his campaign Facebook page on Wednesday, the Republican juxtaposed two images: one showing a twisting mass of snakes, the other a crowd of refugees. This week, governors across the country, including Texas Gov. Greg Abbott, said they would work to keep refugees from war-torn Syria from being resettled in their states in light of the Islamic State’s deadly attacks in Paris on Friday. Many other Texas Republicans have shared similar views. More than 4,000 Facebook users had “liked” Miller's post as of Thursday afternoon, and 6,250 people had shared it. Representatives from the Agriculture Department said they did not "monitor or maintain this page” and directed the Texas Tribune to the commissioner’s campaign, which doubled down on the message Thursday afternoon and suggested it matched the sentiment of most of Americans. The post was elevated to the top of Miller’s page Thursday afternoon. Smith said that would make it easier to find. “I appreciate the attention,” he added. Posts from Miller’s Facebook account have stirred controversy in the past, including one appearing to call for the atomic bombing of “the Muslim world,” spurring an outcry from Democrats and others who called the message intolerant and hateful.